The former men’s waiting room, which once provided a space where men could talk freely, smoke, conduct business and relax while waiting for the train now serves as Sedalia's Welcome Center and Gift & Souvenir Store. 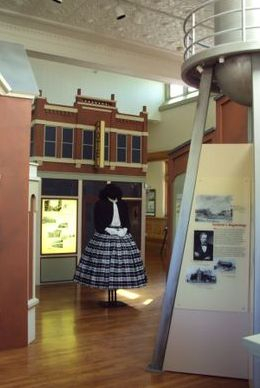 Here, people can pick up maps, get directions and find out about the community’s many historic sites and varied attractions while they browse among the unique selection of gifts and memorabilia on display. Read more . . .
Get a glimpse of what Sedalia, Missouri was like in the Ragtime Era, 1895-1904. For a few short years Scott Joplin lived here and began writing what would not only become America’s popular music, but America’s premier classical music as well. His “Maple Leaf Rag,” published here in 1899, ranks Joplin among the great composers our nation has produced. Thanks to him, Sedalia can call itself a place where America’s music began! Read more . . .
1860—six months before the Civil War began. The war turned Sedalia’s focus from settling to survival, from building to bushwackers. Every person was affected by the war and had a story. Working On the Railroad - 2012 feature exhibit designed to provide modern people with a connection to people of the past and their stories of Sedalia's heritage. Rawhide: Rowdy Days/Rowdy Nights - designed to provide visitors with a unique taste of trail life. Ozark Music Festival - No Hassles Guaranteed - A look back at the 1974 Ozark Music Festival held on the Missouri State Fairgrounds.